The money raised on this GoFundMe will be distributed to nonprofit organizations across the country that are offering general relief to government workers, including but not limited to, food, counseling, and housing support. Show our American federal workers that you stand with them. Across the country, hundreds of thousands of government workers are furloughed or forced to work without pay. They are honest, hard working Americans serving our country. They are showing up to work protecting our coastal waters and keeping our airports and skies safe, among other important duties as civil servants and contractors. They’re going through a very tough time through no fault of their own. They put in a full day, and when they come home they have to figure out how to pay rent, put food on the table, or afford diapers for their newborn. We all read these stories and feel helpless. We are stuck because we don’t know what to do. We want to provide a place for people to take action and help someone in need, because, together, we have power to make a difference and provide critical short-term relief. The over 800,000 federal workers furloughed or working without pay don’t deserve this hardship, but we have the opportunity to take action and deliver a message of hope and solidarity. Our country’s civil servants shouldn’t have to stand in a line at a food pantry, wonder where their next meal is coming from, or wonder if they have enough diapers to make it through the night with their newborn. It’s not right, but there’s something we can do: We can take action. Deepak Chopra and GoFundMe partnered to create a relief fund providing donations directly to nonprofits that are focused on helping government workers impacted by the shutdown. The money raised will be distributed to nonprofit organizations across the country that are offering general relief to government workers, including but not limited to, food, counseling, and housing support. This fund will also provide donations to the National Diaper Bank Network, a nonprofit that is supplying diapers to new parents impacted by the shutdown. Additionally, due to the concentration of federal workers in the DC Metro Area, a portion of the funds will be transferred to the World Central Kitchen, providing free meals to federal workers affected by the shutdown. The full list of nonprofit recipients will be released in the coming days. Funds will be collected and administered by the Direct Impact Fund, a U.S. public charity, and all donations are subject to its variance power. See the applicable policies of Direct Impact Fund here . U.S. donations are tax-deductible. Please consider making a donation or sharing this campaign with your friends and family online. More importantly, leave a message below. Tell the federal workers that you stand with them. If you are a nonprofit servicing federal workers due to the shutdown, we want to hear from you. Please reach out to contact@gofundme.com. The time has thankfully come to turn donations off to this GoFundMe. To provide an update on the incredible work that was done with this funding. We also received messages from several smaller nonprofits around the country sharing what they were doing to help locally. We were able to assist these organizations with small grants to impact more people affected by the shutdown. Thanks again to everyone who donated and shared - it made a difference. The shutdown thankfully appears to be ending. The generosity of over 6,000 donors to this GoFundMe lessened the financial burden on many federal workers and their families, and we are grateful for the help of everyone involved. We recognize that a budget agreement in Washington does not automatically cure all the harm caused to federal workers. This campaign will continue accepting donations and issuing grants until federal employees begin receiving paychecks again. We also recognize that many federal contractors and local businesses remain financially insecure. If you or someone you know is a federal worker in need of continued support, please see and share our partners’ updated resources below and write to us at contact@gofundme.com. Thank you for taking action to support our federal workforce and contractors during this difficult time. Over 3,500 donors have stepped up to support our civil servants and contractors who are currently furloughed or working without pay. We’re grateful to announce that we’re now partnering with 4 nonprofits working tirelessly to support federal workers affected by the shutdown. The nonprofits include World Central Kitchen, the National Diaper Bank Network, Feeding America, and the Federal Employee Education and Assistance Fund. These organizations are providing essential resources during the government shutdown, including food, diapers, and money to low income federal workers. The first round of grants are being issued today- $50,000 to each organization. Additional grants will be announced in the coming days. If you or someone you know is a federal worker in need of support, please see and share our partners’ resources below. By supporting and sharing this GoFundMe you will help these charities make an even bigger impact. Thank you for helping us spread the word and take action to support our federal workforce. Kitchen and Cafe open 11 AM - 6 PM daily - The Kitchen and Cafe will provide free hot meals and to-go items for federal employees in need and their families. Resource Center open from 9 AM to 5 PM daily - The Resource Center will provide support, groceries, diapers, and pet food to employees on furlough. Dallas – Hope Supply Co. Feeding America’s mission is to feed America’s hungry through a nationwide network of member food banks and engage the country in the fight to end hunger. Every $1 donated helps provide at least 10 meals. 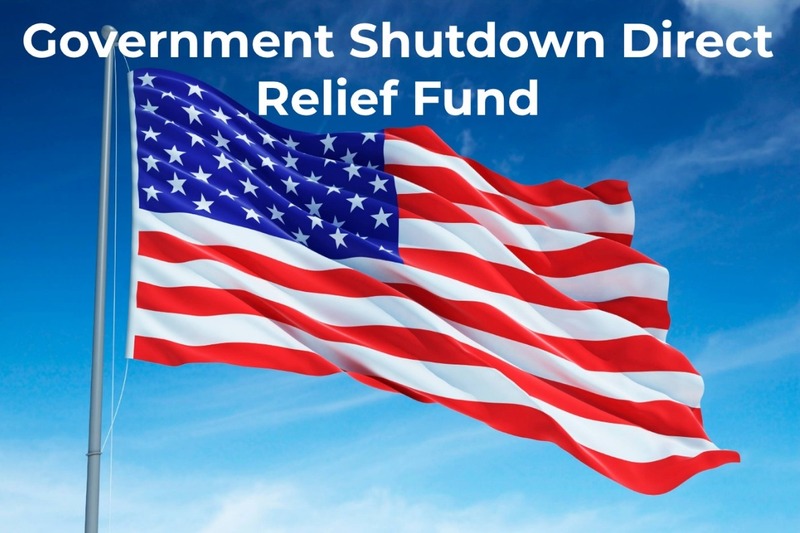 The Federal Employee Education and Assistance Fund through its emergency assistance program will assist low-income federal employees facing unforeseen hardships due to the partial government shutdown. Feds with an annual salary of $35,000 or less who have been furloughed or are working in excepted status and not receiving pay can receive a $100 grant to help cover essentials like groceries gas, and diapers. While this micro grant does not replace missing pay, FEEA hopes it will help feds with things like feeding their families or paying commuting costs.